Remember those bright summer days when you were a kid and the familiar jingle of music blasting through the neighborhood caught your attention? You’d drop everything, ask your mom for money and start running or biking toward the source of the sound. "The ice cream truck! 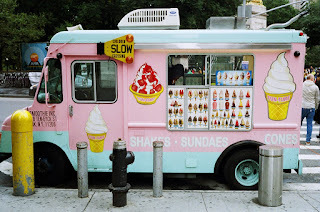 The ice cream truck!" Icy cold refreshment was around the corner – literally! Well, when I was thinking how hard it can be for some of us to get to church to pray before the Blessed Sacrament, I thought wouldn't it be great if we could have a Blessed Sacrament truck that drove around neighborhoods, bringing Jesus to the Faithful? When hearing strains of “Oh Sacrament Most Holy” and “Tantum Ergo” or maybe church bells, all the Catholics would run out and wave down the driver! Moms with a half dozen little children in tow, older folks with walkers, busy business folks working at home could quench their spiritual thirst. In some neighborhoods, the loud-speaker might blast "Gather Us In" and "One Bread, One Body," but the results would be the same. I can think of nothing better for one's spiritual growth than time spent in quiet prayer, especially in the presence of our Eucharistic Lord. And yet, piling little people into the car between meal times, nap schedules, household duties, and homeschooling, keeping them seated in the Adoration chapel without disturbing the regular adorers and being able to quiet one's mind enough to actually pray, is difficult to schedule in on a periodic, let alone regular, basis! But the difficulty in achieving it does not diminish the desire to do it. Truly, this could work! I have heard of a mobile confessional in the Diocese of Lafayette, Louisiana. In this Our Sunday Visitor article, Fr. Michael Champagne, the man behind the mobile confessional, is quoted saying, "During the Year of Mercy we want to bring the sacrament to areas where people otherwise might not be able to get to confession." A mobile Adoration chapel would do the same! If it were equipped with a priest as the driver, it could provide both! It could travel to certain areas on a schedule that would allow people to have a regular adoration time, as well as stop to admit spur-of-the-moment adorers. A small bus or large capacity van could easily be transformed with a tabernacle in the rear and seats turned around to face it. Driving through towns and neighborhoods would not only bring the Blessed Sacrament to those who find it hard to get out, but the presence of Our Eucharistic Lord in some places, for possibly the first time ever, would certainly have unanticipated beneficial effects on those areas. I’m hoping this idea will take hold with someone “out there” who could make it a reality. It may never happen in my neck of the woods, but there is surely some priest or bishop somewhere whose people need this idea. It is my prayer that someone reading this might be inspired to offer the donation of a vehicle. Maybe a religious community dedicated to missionary work or devotion to the Eucharist just might have what it takes to make this a reality! If you think it’s an idea whose time has come, pass it along and say a prayer! Who knows, we might soon be running out our doors at the jangle of Ave, Verum Corpus to spend a few minutes in the company of Emmanuel – God with us. Such a great idea! It would be interesting to see the world's reaction, the news, the protests, the witness. It would make a great story too.